The country of Venezuela is located in the continent of South America, wherein it shares borders with Brazil, Colombia, Guyana, and Trinidad and Tobago. Due to its rich array of wildlife the United Nations Environment Program named Venezuela as one of the most bio-diverse countries in the world. In terms of bird species, it’s been estimated that approximately 45 endemic birds can be found in the country. The Tepui tinamou typically measures approximately eleven inches in length, and can be found in the southeastern regions of Venezuela. This ground bird isn’t a strong flyer and instead prefers to spend time in moist or tropical forest areas. The back of its head and neck are brownish in hue while its throat and the sides of its head are shaded grey. The Tepui tinamou has olive colored legs with a black upper jawbone and a lower mandible that is yellowish with a black tip. It lives on a diet that consists of a variety of leaves, seeds, flower buds, fruit, and even small invertebrates. In an attempt to stay safe and be camouflaged members of this species regularly build their nests in dense brush. The males of the species take on the job of incubating the eggs which may have been laid by as many as four different females. The male also assumes the responsibility of raising the newborns for a period of two to three weeks until the young are able to be live on their own. The Carrizal seedeater lives on Isla Carrizal off of northern Venezuela where it inhabits the region’s bamboo forests. This bird typically grows to about 4.7 inches in length and reaches a weight of approximately 0.4 ounces. Males of the species sport dull gray feathers peppered with bits of blue while females are yellow in color. Not great deal of information is available on the Carrizal seedeater due to its rare status and the fact that the first reports of sightings only date back to 2003. Because of the destruction of its limited habitat the Carrizal seedeater is considered to be critically endangered. The Caracas brush finch was named after Venezuela's official capital city of Santiago de León de Caracas. Members of this species usually measure approximately 7.5 inches in length while making its home amid Venezuela's humid rain forest and cloud forests which are located along the nation’s coastal range. Birds of the species subsist on a diet of seeds and nuts and typically search for food on ground level amid the underbrush. The Yellow-knobbed curassow is a large, predominately black, bird with a crest on its head which curls forward. These birds are so named because the males of the species have a yellow toned knob at the base of their bills. They live in the woodland and forested areas of Venezuela.Yellow-knobbed curassows search for food on the ground and eat a diet of seeds, leaves, small animals, and various fruits. Both male and female birds of the species are involved in the construction of the nest which is built off the ground and in where the female usually lays two eggs. Like many native birds in this South American nation, the Yellow-knobbed curassow has been designated as a near threatened species. The Venezuelan wood-quail has a spotted coat and is known to inhabit Venezuela's subtropical forests and mountain areas. Unfortunately this is one of an array of native species which have suffered due to habitat loss and harmful human activities such as hunting. The Venezuelan flowerpiercer is a small bird which is characterized by a hook on the tip of its beak. The male of the species has black feathers with white tufts on the sides. The female is mostly olive brown in color with a muted yellow head and brown toned underbelly. The Venezuelan flowerpiercer makes its home in tropical and evergreen forests as well as mountainous regions and scrub land. It’s estimated that the current population for this species numbers at around 1,500 to 7,000 mature individuals. This bird is threatened by habitat loss and is considered to be endangered. The Saffron-breasted redstart has a very limited range and lives in areas of the country with humid climes. It makes its home in Venezuela's high altitude forests as well as the country’s cloud forests. The physical characteristics of the Saffron-breasted redstart include a muted greenish grey coat, black tail feathers, white throat, and orange-yellow belly. It’s a near threatened species that’s considered to be rare. One of the major threats to these birds is ongoing loss of habitat. The Paramo wren is one of Venezuela's many endemic birds and is named after the Paramo ecosystems found in the northern mountains of the nation. Members of this particular species live in habitats that include highland and tropical regions as well as the country’s grasslands. Urich's tyrannulet is a bird which is characterized by its olive feathers and dusty grey crown. It can be found living in Venezuela's subtropical and tropical mountainous areas and has a diet which includes a variety of insects. This species has been deemed to be endangered, a status which is largely the result of man made environmental changes which in turn have caused unfavorable living conditions for a number of bird species. The Groove-billed toucanet is a colorful bird with a green body, white throat, a black bill, and a blue coloration surrounding its eyes. Adult birds grow to an average of 14 inches and weigh approximately five to seven ounces. This particular species also includes the yellow colored bill toucanet. These birds lives in mountainous areas, humid forests, and woodland regions. On occasion this species may also make its home in garden areas such as the protected land of Venezuela's historic Henri Pittier National Park which takes its name from a Swiss born scientist who spent many years studying and classifying the region’s rich plant and animal life. The Groove-billed toucanet usually hunt for food in small groups and are known for making a nasal sounding singing sound. 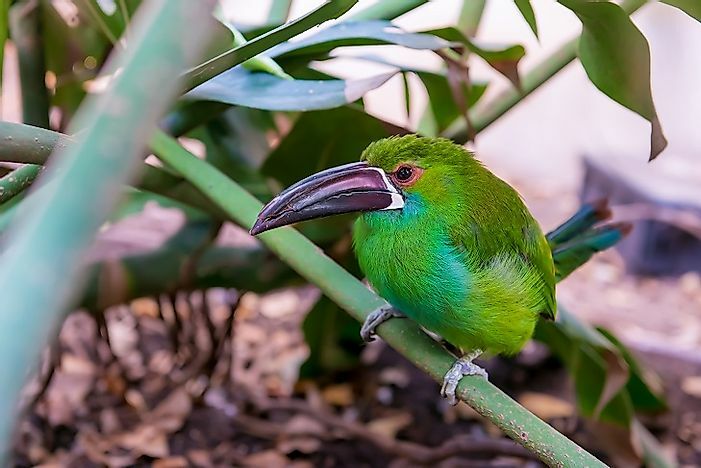 Unlike a great many of the nation’s native species the Groove-billed toucanet is considered to be of the least concern in terms of threat status.